It's Spring and MyFig construction rolls on! April was a flurry of activity, and work in May continues to progress toward our grand opening. From storm water management, sidewalk construction, medians, and plantings—our team is working hard to finish this large project. Here are some of the accomplishments and next steps on work along 11th Street and Figueroa. Work on 11th St has migrated to the south side, with a new catch basin and storm drain system now complete. A surveying crew is currently working between Broadway and Figueroa preparing for the construction of new sidewalks with pedestrian safety improvements, including curb extensions and intersection bump-outs. Demolition of the existing sidewalks and construction of these improvements will happen over the next few weeks. Meanwhile, on Figueroa, bus platform construction continues, with work on the northbound bus platforms nearly finished. The five northbound bus platforms between Exposition Blvd and 23rd St are already complete, and the remaining five between 11th St and 8th St will be finished shortly. 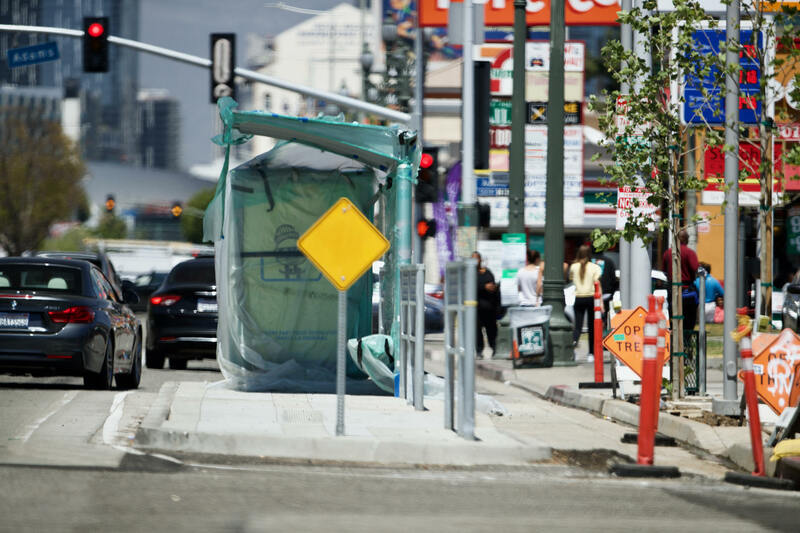 The four southbound bus platforms (between Adams and Exposition Blvd) are currently awaiting railing and bus shelter installation over the upcoming weeks. New curb and gutters for two new medians were installed between Exposition and Jefferson, with median landscaping soon to follow. Along the sidewalks of Figueroa, new landscaping and trees are currently being planted, and street resurfacing between Exposition Blvd and 30th St has already taken place. Bureau of Street Services will be resurfacing the remaining segments of the MyFig portion of Figueroa incrementally throughout the remainder of the project. Following the resurfacing, new technologically advanced traffic signal controllers are being installed at each intersection by LADOT. These are the most advanced signal timing and phasing controllers in the city to date. They are the first of their kind to be installed anywhere in Los Angeles. Three intersections received the new signal controllers last week, with the other intersections soon to follow. Follow us on Twitter, Facebook, and Instagram to stay tuned for additional updates as we get closer to the opening of MyFigueroa!